Ronafly Creations is a store created by Rowan Hogervorst and based in The Netherlands that offer a rather lovely collection of accessories inspired by Nature and Fantasy. Pieces are nickel and lead safe and often includes hand sculpted ornaments in clay and are embellished with cabochons, gems and stones. Some pieces try to mimic the texture of Nature, the cracks on ice, the waves of water, firey molten lava... they are indeed items inspired by the everchanging shifting magic of the seasons. Some of the items are ready to ship and other pieces are made to order so please take into account delivery times at their etsy store. Rowan also welcomes contact for new ideas for commissions and special orders, so if you have something in mind, maybe she can "bring it to life". Right now, a few days from Winter Solstice the etsy store has a rather large list of icy, frosty, sparkling silver, white, and ice blue wintry creations. 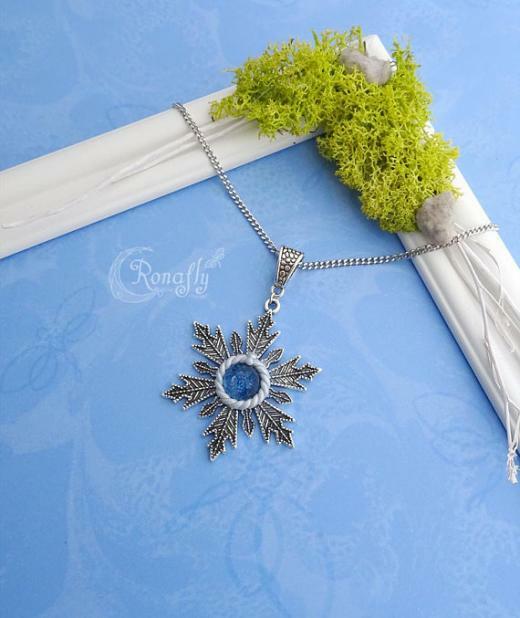 Below: me wearing a lovely ice-snowflake winter pendant courtesy of Ronafly Creation (Thank you Rowan). I am a December Child and I loved your present. as a rather large list of icy, frosty, sparkling silver, white, and ice blue wintry creations.